This year, we made it a priority to analyze the adoption of Domain-based Message Authentication, Reporting & Conformance (DMARC) in industries using email as a key means of communication and business growth. We looked at the domains of the SaaS 1000, top law firms, nonprofit organizations (NPOs), higher education institutions, top Chinese brands, and e-retailers to better understand how seriously they take email authentication. Unfortunately, not one industry reviewed had even a 50% adoption rate, meaning the highest performing industries still greatly underestimate the risk associated with failing to meet email authentication best practices. One connection many email marketers are missing is the direct impact a strong DMARC policy has on email reputation and deliverability. In a recent case study, 250ok customer Furniture Row experienced a 10-15% increase in deliverability at Gmail, and saw improvement at all other major mailbox providers, within three days of moving to a reject policy. 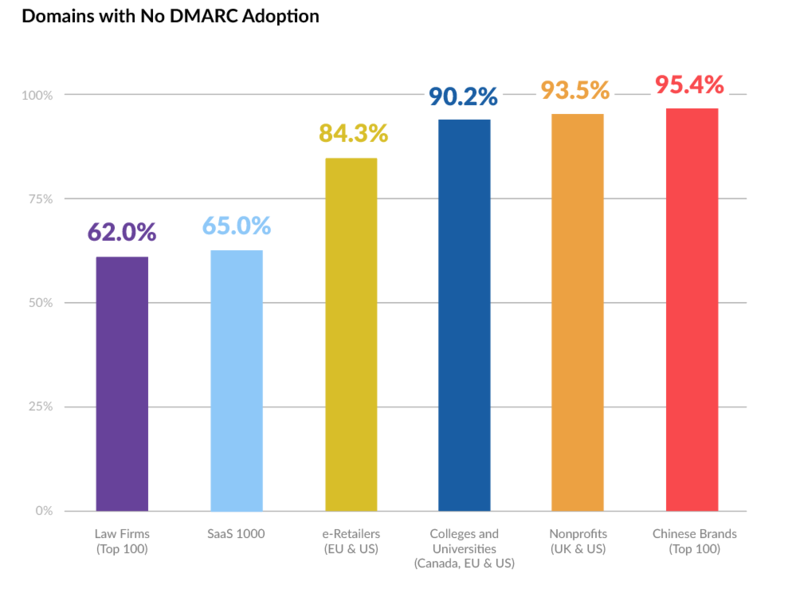 Adoption rates varied widely, with 95.4% of Chinese brands reviewed having no DMARC policy at all to top law firms’ rate of 62% of non-adoption. While reviewed legal domains surpassed adoption of all other industries, including the SaaS 1000 (65% without DMARC policies), they along with all other analyzed industries did not come close to having even 50% adoption of DMARC protection. By deploying and monitoring DMARC, brands lower the likelihood their domains are spoofed and used for phishing attacks on email recipients, including customers, clients, employees, among others If a brand is indeed spoofed, the impact on brand reputation and trust can be monumental, and this doesn’t even begin to consider the potential tangible losses of both the business involved or customers’ attacked. For more information on how 250ok DMARC software and services can protect your domains through responsible DMARC deployment, contact us for a demo today.